The perfect accessory if you regularly change wheels, track days, concourse competitions, motorsport or just change tyres from winter to summer. These heavy duty cases are a must to stop the interior of your car and hands getting dirty. Manufactured from balistic nylon with integral handle they are extremely tough. The velcro closing and wrap around design enable them to fit anything from a 13" wheel up to a 17" wheel, with a maximum width of 11". 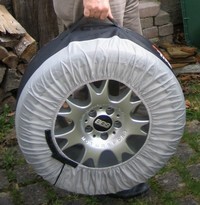 Vertar Tyre Cases are machine washable so you can put the dirtiest tyres in your car with no fear of scuffing the interior. They are supplied in pairs. If you have a special set of wheels for a concourse vehicle these cases & felts are the ultimate for keeping them clean and scratch free. "Thank you for prompt service - the charger is great and excellent packing. I will recommend you to all my friends. (Accumate Battery Conditioner)"